Best on black. Even those antennae seemed to be dew covered. Couldn't identify (or have the time and patience right now) to narrow in on which little guy he was - but do enjoy them. Oh my goodness. The poor thing is waterlogged. Excellent find and capture! This is very unique. Nicely captured shot. Nicely spotted. Funny, I don't think of how the rain effects these little critters. Looks like a flying fish! You captured those droplets perfectly and the lighting behind is fantastic! That's incredible to see how wet he is! Great capture. I can't get over how much moisture you have there. This is an amazing image. I think it is probably a skipper of some kind. My goodness, he is soaked to the gills. Fantastic image. Can't believe that it wouldn't flap the wings to get some of the dew off of it. Great capture. This is incredible Milanie. 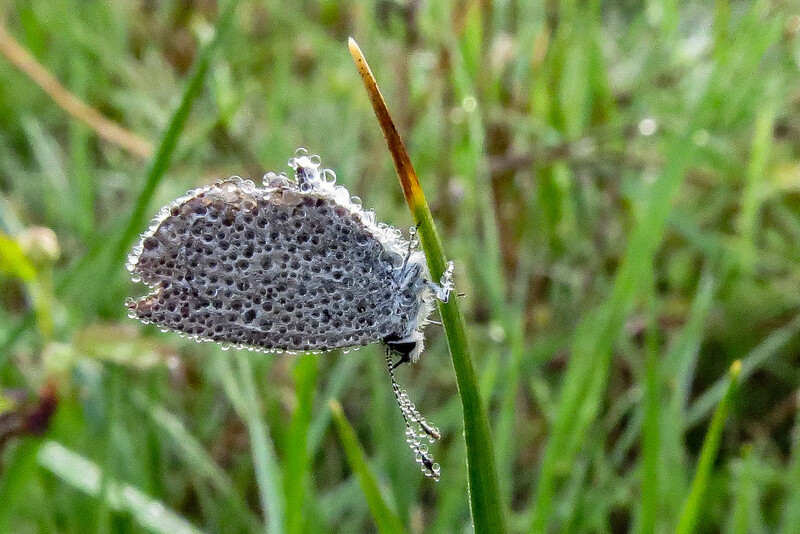 Can't believe the dew drops on the antennae too. Amazing detail of those dewdrops on the poor water logged thing. Wonderful capture.